He is the evil one, the Prince of Darkness, the ruler of Hell. Satan conjures up horrifying images of a horned beast whose sole purpose is to destroy humanity. Yet there is evidence that the fallen angel we know as Satan may be misunderstood. New interpretations of ancient texts indicate that Satan may have been an extraterrestrial who was more of an ally to humanity than an enemy by passing along knowledge that planted the seed for civilization. Could Satan's reputation as the personification of evil be his punishment for leading early man out of darkness and ignorance? If so, might his evil acts really be expressions of revenge against the human creatures that abandoned him? 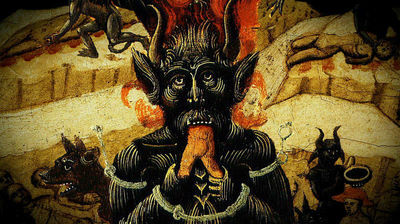 Or are the devilish deeds associated with Satan part of a grand plan? A series of moral challenges intended to prepare us for our next, and perhaps final... close encounter?